What exactly are aluminum louvers used for? Today, we take a look. First, let’s talk about what louvers are because we have all seen them at some point, but probably never knew there was a name for them. Louvers are the slots used in doors and fences to allow light and air to come through, while keeping dirt and debris out. There are a variety of different styles, some geared more at keeping noise out while others are more for ventilation. Now that you’ve decided louvers are what you came here for, the next step is deciding what material to use for them. Aluminum is what we recommend and here’s why. Louvers are constantly outside and have to deal with all of the elements that come their way. It’s important to use a material that will hold up despite that week long rain storm that may be headed your way. No one wants to have to worry about touching up their louvers every few months because they have started to rust over time. This benefit of the aluminum material can end up saving you a lot of money in the long run because you don’t have to worry about maintenance as much. Using aluminum louvers, you also don’t have to worry about the color fading, leaving you with louvers that look brand new, even years later. Being eco friendly is really important in this day and age where there’s so many things polluting our earth. If you choose to invest in aluminum louvers, you eliminate the concern of damaging the environment. On the contrary, aluminum is actually beneficial to the earth. It is a completely recyclable material and will never end up in a landfill. Since the aluminum material is so durable, however, you don’t have to worry about replacing the louvers for a long time. They can stay standing and fresh for generations to come. Aluminum louvers can be completely customized to fit your specific needs. 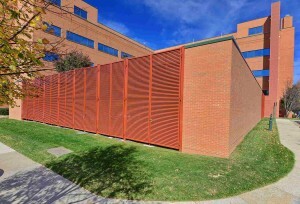 Some people want louvers to surround their home, while others need it for a large office building. Because aluminum is such a flexible material, it’s good for both of these scenarios, as well as everything in between. In addition, it’s also versatile when it comes to the type of terrain you are working with. Aluminum works well on everything from grassy land to dirt roads. Have you decided aluminum louvers are the style you want to use? The professionals at Hercules Custom Louvers are here to help. We can assure you that our custom louvers will serve you and your family for years to come. For more information on how we can meet your customization needs, please give us a call at 1-800-331-2590 or visit us online. You can also check out our Louver Gallery to get some ideas for your next project! For updates and to see other projects we’re working on, visit us on Facebook, Twitter, LinkedIn, YouTube, Google+, and Pinterest. This entry was posted on Friday, January 12th, 2018	at 3:21 pm	. You can follow any responses to this entry through the RSS 2.0 feed. Both comments and pings are currently closed.